On the way out of the Central Branch of the London Public Library, I noticed a table with a sign: Take Away Art. An man of many years with a walker noticed the same table, and instead of avoiding it, as in avoiding contact between strangers, we both stopped and checked out the artwork in a basket: screen-printed canvas, black on natural canvas, likely cotton. The man told me he had made artwork many years ago, up in Kincardine where he lived until 25 years ago. He had a favourite piece, one he’d painted on glass. He’d lived at home until he was 22 because there was a dance hall across the street from him, no need to leave for some excitement. In his “old” age (he confessed to feeling quite young at times) he was studying Greek and Hebrew, and “all the universe,” which, if I understood him well enough, boiled down to the number 5. Then he had to go, but as with many long-lifers, he gave me his opinion that young people weren’t active enough, and how it was a shame. There had been too many teens drowned in the lake up his way in recent years. He didn’t remember anyone drowning when he was a youth. Young folk, pay attention and get a life outside your media devices. Such was our encounter, a rambling circling chat between generations. But, he wouldn’t take a piece of art. He wanted to make something himself. I took a piece of art–it seemed too much good fortune just to pass by. The back of the canvas is signed, and there’s details about the print run. Only, I would ask Charles Harris (working on his MFA at Western University), if he’d be really upset if I embellished his Take Away Art. Not sure how to reach him. I have been putting away the devices for more and more of my days, and I’m embroidering. Not like my mom or gran, but like me. And if ever there was a piece of cloth needing embellished, it’s this Take Away print. Like fries needing ketchup. Sorry Charles. In any case, without this Take Away Art in the branch of the Central Lbrary, I wouldn’t have had such a charming chat. Cheers to the Take Away Artist! A lot of my life is spent wondering. And I wonder at my mom, how she manages living deeper and deeper in dementia. A while ago, her older sister, who also had dementia, passed away. I wondered how a person with dementia would respond to the news that a loved one had died. I wondered how dementia might have affected the sisters in the first place. Would they still have a relationship, each in their own world? 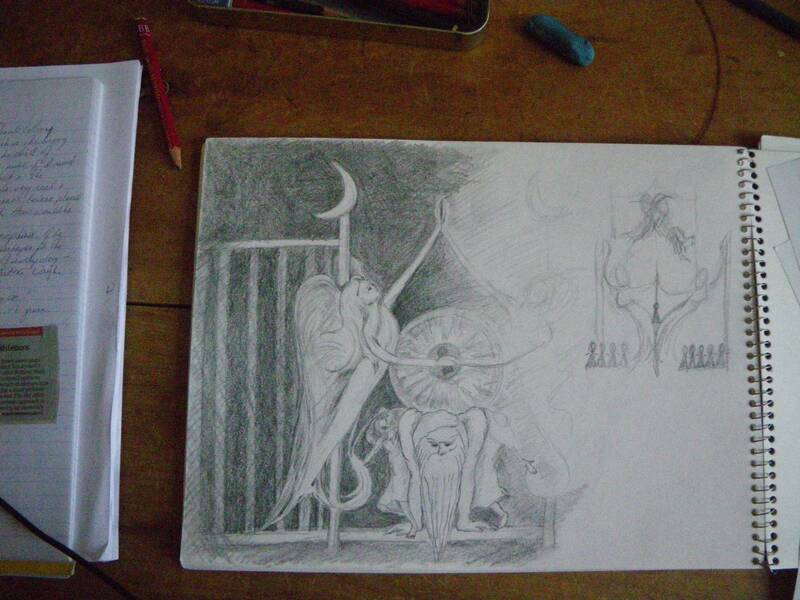 This playful drawing came after writing a short bit of fiction about this. Sometimes drawing helps with the wondering where words fail. 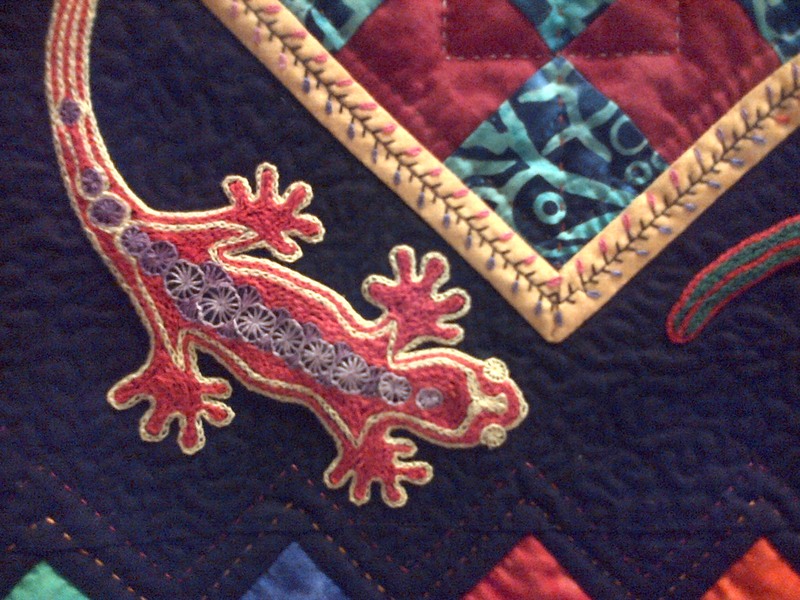 Volunteering for Out of Africa quilt show arranged by the London International Quilt Festival was really cool. My friend and I spent more time with quilts than we normally would have, and with the other volunteers and the circle of vendors around the room. A quilt, apparently, can be broadly defined as a fancy top and a back, with a batting sometimes in the middle. 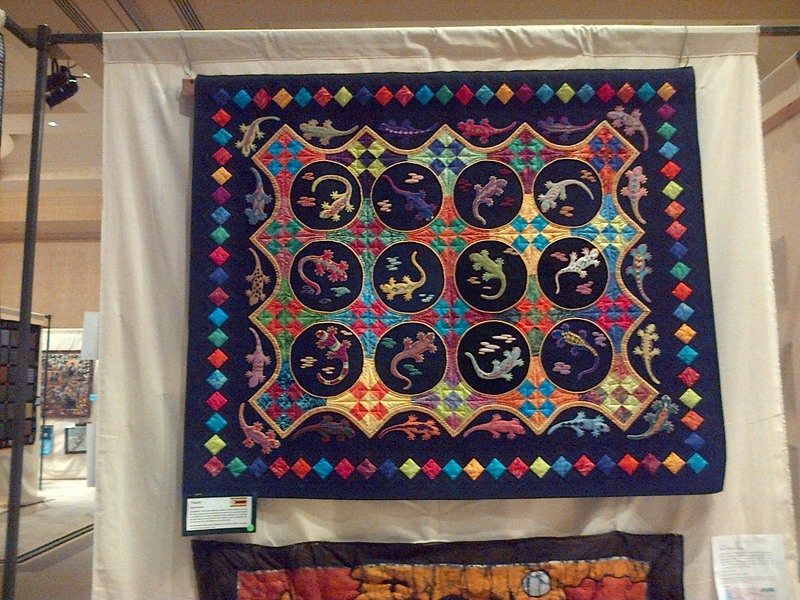 At this show, there were very few, if any, quilts like the traditional ones my grandmother would make. Almost all of these quilts from the African continent were meant to hang on the wall. 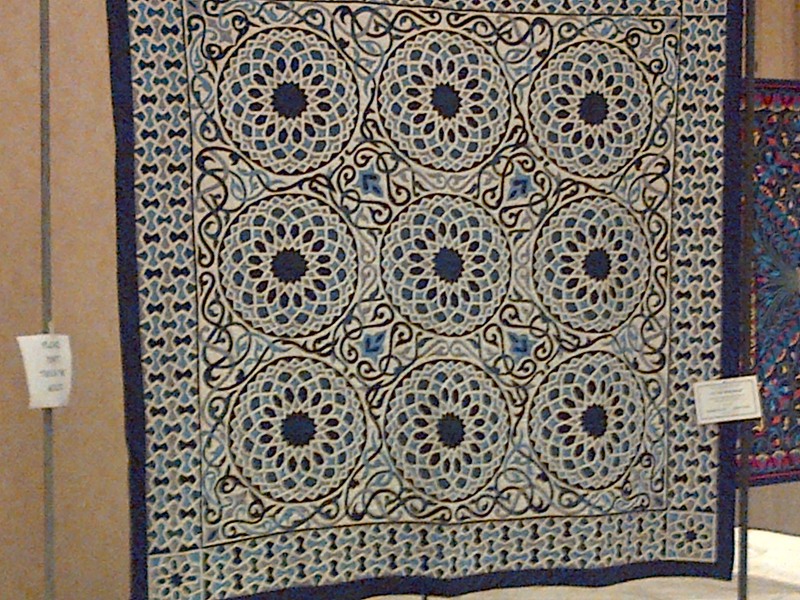 Stunning “quilts” from the Men of Cairo collective were actually tent walls, and resembled Persian carpets or mosaics. African animals, cultures, traditional and everyday life were celebrated with brilliant colours, sombre desert hues, embroidery and embellishments. I didn’t get to the lecture on the African quilts, but I did meet a volunteer, Hasebenebi Kaffel who knew the subject in broader terms. I mistook him for a member of the Men of Cairo collective. He really works for the UK-based ACORD and has been to Cairo many times, he said. Also a member of ACFOLA, he was at the show to volunteer his knowledge of Africa. He told me how long ago he fled his home in Eritrea with nothing, and then ended up in front of the World Bank to deliver a paper on the importance of gender in the economics of developing countries. Very interesting! Alas, I did not make any purchases. There were vendors from all over the world, but instead of getting into something new, I vowed to finish the quilt that I started 30 years ago. I know, I’m amazed at how quickly time has passed. “The Wedding Plate” is pieced bits of fabric from projects that my sisters and I made in our teens–dresses, PJs, blouses, pot holders, whatever–and I need to finish the quilting and bind it. It’s good that Africa came to London, for the education, inspiration, and the joy!! 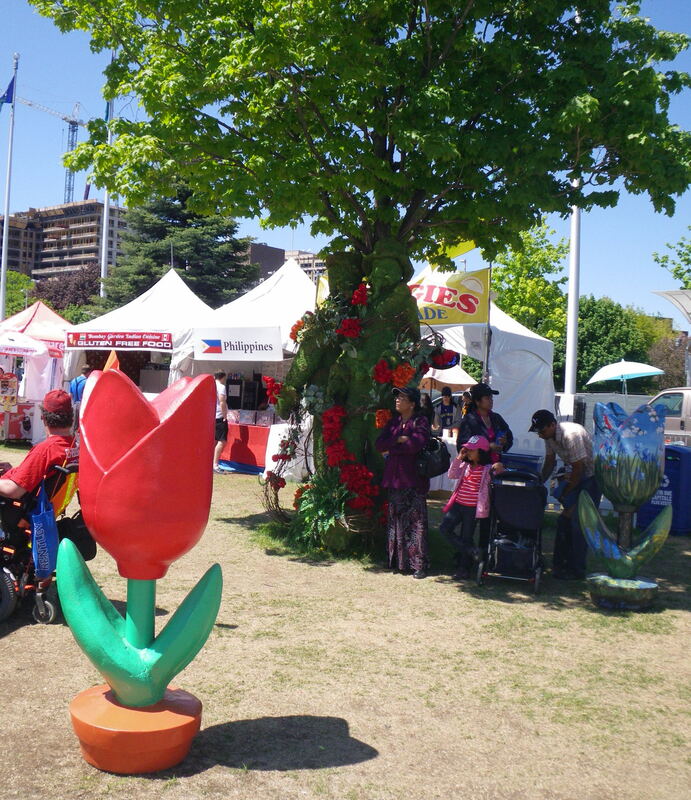 The Tulip festival was in full bloom when I visited Ottawa. 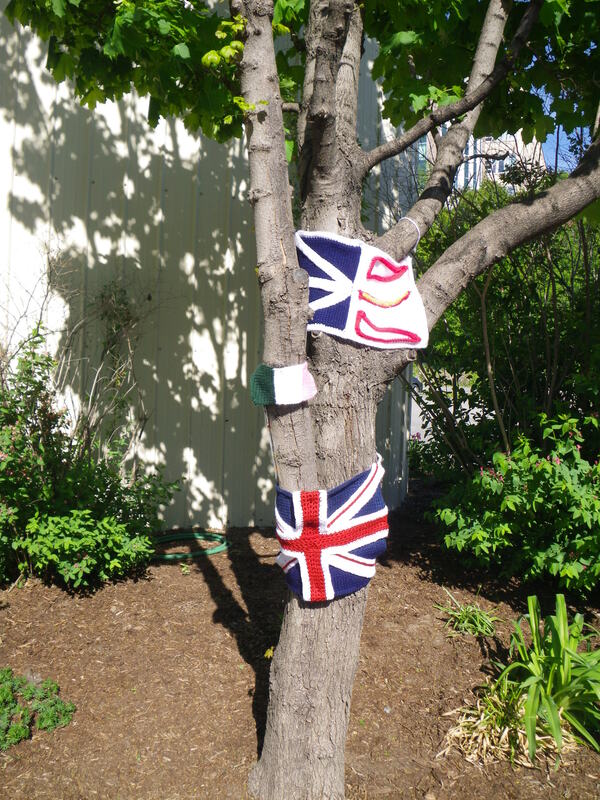 Ties between Canada and Holland, made during World War II, continue and I love that it’s through planting flowers and not through war memorials. The activity of planting bulbs each fall and waiting for the winter snow to melt, for the tulip bulbs to burst into our Canadian spring, however short it may be, is full of hope. 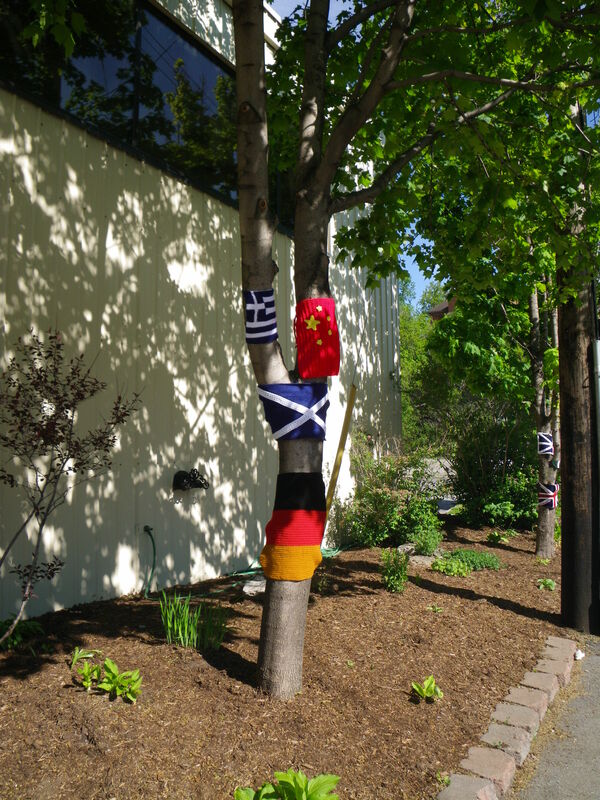 I walked back to my daughter’s house after checking out the Tulip Festival activities at City Hall, past the Nanny Goat Hill Community Garden, and then I came across a yarn bombing by seniors in the trees in front of The Good Companions Seniors’ Centre. 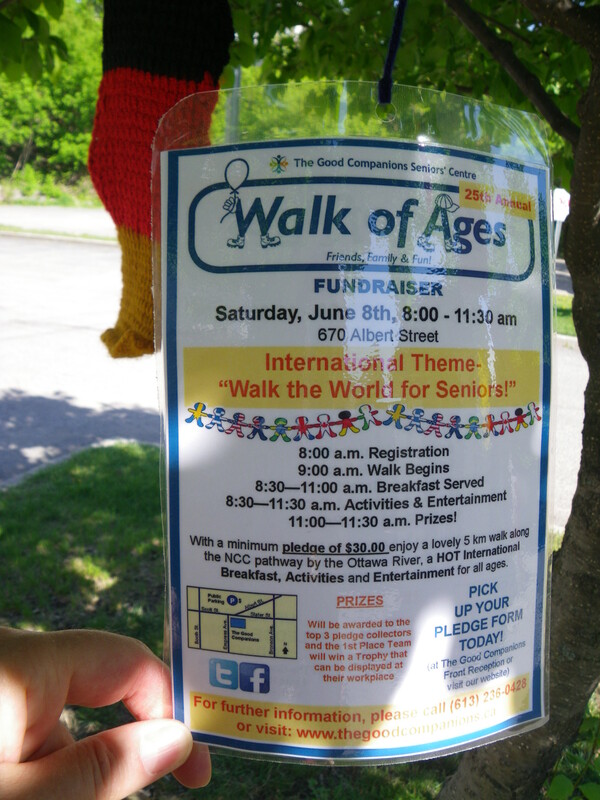 They are getting ready for their annual Walk of Ages fundraiser. 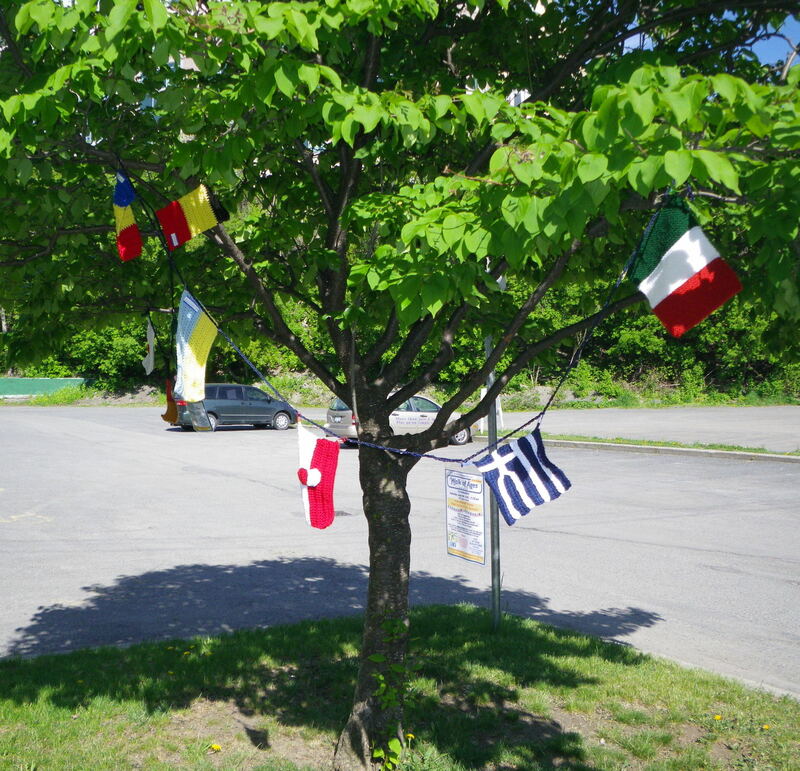 All the flags attached to the trees were knit or crocheted. Imagine the history of the last century if this tactic had been used. If Dickens had written not of Mme Lafarge merely watching the beheadings and knitting the names into the fabric, but of her knitting covers for the guillotines, crocheting a woman’s discontent and fixing it to icons of her displeasure. Perhaps more lives can be saved as cunning fingers wrap yarn around people and place. I didn’t know what I was getting into when I emailed a woman about her advertisement for free copy editing in the London Writers’ Society newsletter. She turned out to have a good eye for missed words, inaccurate spelling, and phrasing that could be better. Sue had a background in speech pathology, she told me over our first cup of tea. She was from Stratford, at least that’s where her parents had lived the longest, where she graduated from high school. I was from Stratford too, I told her, but we were a number of years apart in age, and didn’t have any real connection that way. Then we discovered we had lived in the same house. Her family had come from a small town and her father was to become a high school principal. My family came from Toronto and my father would become the VP Finance for a furniture manufacturer. 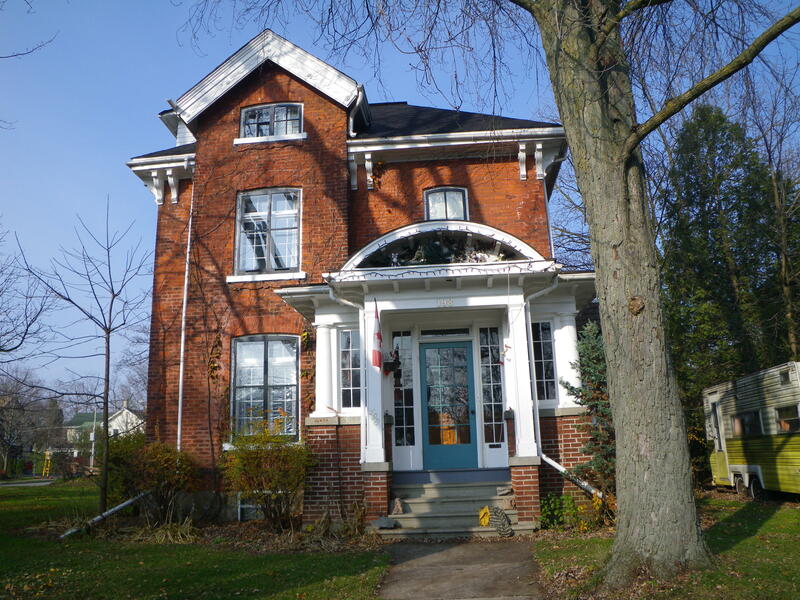 Our families’ first homes in Stratford were the same place, on the second floor at 198 Church Street. Sue remembers her mom getting groceries delivered from the corner store and her grandfather having a room in the attic. I was only four, but I remember the bats descending from the attic into the living room, and the sturdy crab apple tree where my brother got caught in the branches with his winter coat and swung from it, as though he was in a cartoon. Neither family stayed long. We moved kitty-corner through the block to rent a whole house on the corner of Birmingham and St. David streets until our new house in the suburbs was built. Sue’s family moved to Mornington Avenue across the street from St. James Church. Apparently there was a pattern for professionals with families immigrating to Stratford. Perhaps first, they had to pass through 198 Church, second floor. My friend Charlotte and I went to the opening of the medium gallery (yes, it’s all lower case) in the Old East business district on Saturday night. In 2011 a photographer, Johan Hallberg-Campbell, had flown into the bush of northern Ontario with the Canadian Red Cross to photograph their efforts to supply Attawapiskat with sleeping bags, heaters and winter clothing. This poster photo is the least representative of the exhibit, a romantic, christianized image, and it was placed next to a photo of a beautiful but very sad young woman living in the crawl space beneath the floor of a house, her arms marked by cutting. Hallberg-Cambell said, to paraphrase, that while he was in Attawapiskat, he didn’t want to traumatize the citizens there. He found them to be gentle and kind people, and he knew the general media was using images for articles that would result in misunderstandings, or misrepresentations, that would further politicize the situation. The images he chose for the exhibit were personal and sincere. It was well worth the visit. Years ago I lived on another northern Cree reserve in housing that was trucked in, just as the housing is being trucked into Attawapiskat. The 3 months I spent at the Red Earth IR have had a huge impact on me. 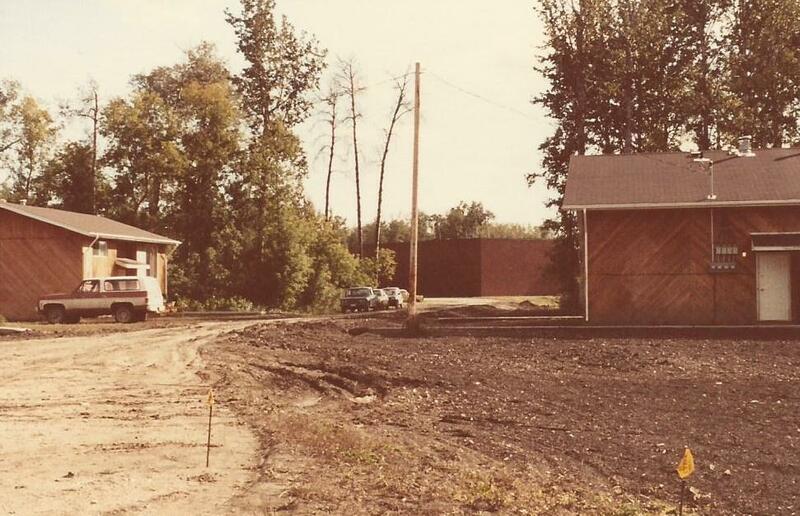 The newly built high school and two 4-plexes for used offices and teacher housing on the Red Earth IR, Saskatchewan. The only new buildings I saw on the reserve. 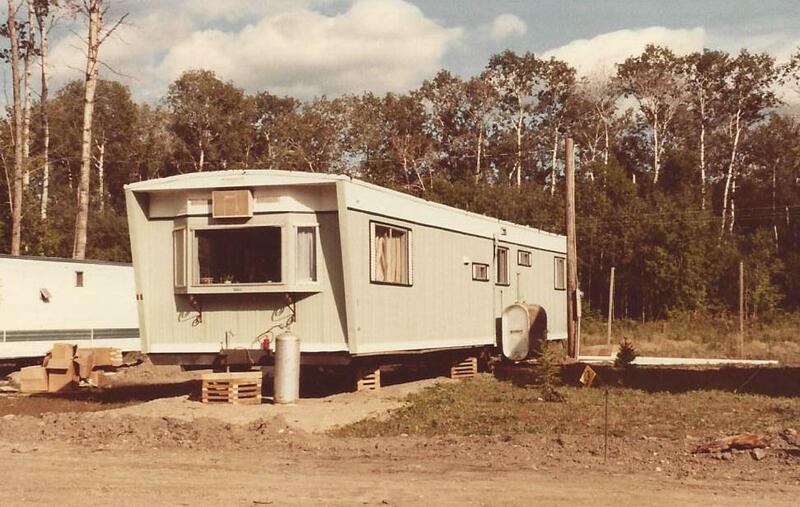 The trailer I lived in while teaching in Red Earth, Saskatchewan, newly trucked in and waiting for insulation and skirting. The housing I lived in was considered “new” housing on the reserve, a used trailer with frustration already punched into the walls. The gas for the stove came from a big propane tank that looked like a bomb at the edge of the clearing, beside the tree that the bear liked to maul. Our neighbour in the next trailer had a small gas explosion after he came home and lit the pilot light. The hospital was over 80 km away, but luckily his burns weren’t severe. And we were teachers, told that our housing was “nicer” than most of the residents. As the seasons turned from Saskatchewan prairie summer to fall and then winter, I came to know more about the resiliency of the people who held on despite the incredible patronizing system that kept the once vibrant community dysfunctional for decades. I can relate to how Halleberg-Campbell photographed both the life-threatening poverty, the trauma and the beauty of the gentle souls in Attawapiskat. 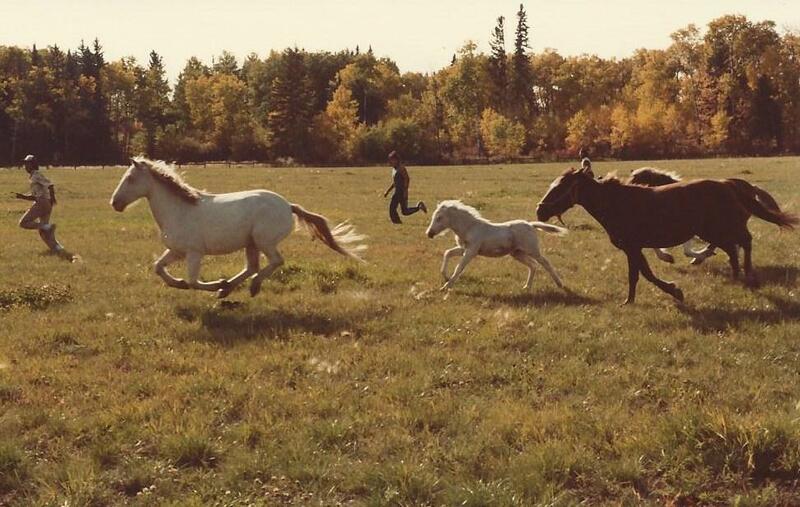 Horses were still part of the treaty agreement on Red Earth 29, and they mostly ran in a herd fending for themselves against wolves and bears. The Cree still rode them, just had to round them up first. All those years ago I was shocked at discovering the biggest “secret” in the Canadian family closet. The missionaries of my childhood church had us folding bandages and diapers, collecting school supplies and donations for Africa. Our grannies should have have been knitting and praying for those on the reserve I worked at. I didn’t know third world conditions existed in Canada. Our schools should have told us about contemporary “Indians.” Our treatment of them remains appallingly political and needless to say, less than christian. As a direct result, I became a feminist, an atheist, an activist. 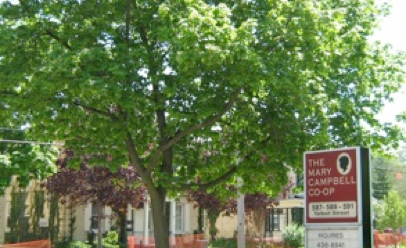 The medium gallery is part of a community economic development project in the Old East area of London, Ontario, where a large percentage of the residents are also struggling with neglect, poverty, mental health, drugs and prostitution. The anti-poverty advocacy group, Life*Spin has spear-headed this new development. Their neighbour, Artisan Bakery, also opened on the same night.